As the Committee worked with Ruzicka Associates and City staff to design the Equestrian Center, it became clear that the proposed site on the park property was not sufficient to accommodate the needed facilities. City staff suggested an alternate location on property owned by the City of Lakeport Municipal Sewer District (CLMSD). This site is located adjacent to State Highway 175. The Committee enthusiastically embraced this proposal. The City Council voted unanimously to approve this change at its meeting on Tuesday, May 2, 2017. While the new site is not within the boundaries of the Westside Community Park, the Committee will still be responsible for the development of the Equestrian Center. Currently, Ruzicka Associates is developing the drawings and documents required to obtain an encroachment permit from Caltrans allowing access to the property. Once those documents are complete the City of Lakeport Engineering and Public Works Departments will make application to Caltrans. When the encroachment permit is issued the Westside Community Park Committee will be able to begin construction on the access. Follow the link to read this Lake County News article for the full details. An area was established on the original master plan for the Westside Community Park for an equestrian center. It is approximately 4 acres in the southwest corner of the park. The Committee met with Lakeport City staff during the summer of 2014 to discuss the issues involved in beginning development of that facility. Following those meetings, the Committee request the project be placed on the City Council agenda. The Council vote to give the Committee the authority to begin preliminary planning. This planning will include a needs assessment, financial viability and preliminary design. 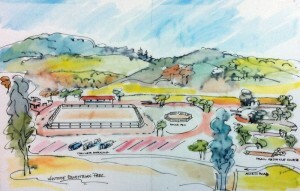 Conceptual drawing of Equestrian Center by Virginia Vovchuk. Read the article on the Council’s action in the Lake County News here. You can read the script of the Power Point presentation to the Lakeport City Council here. Goodie bags for a 5K run aren only a way to entice runners to participate,Replica 350 Boost Online, but also a way to score sponsors for your event. After all,Cheap Jerseys Wholesale, active runners are the ideal target for a number of sponsors,replica michael kors, Mark Beal,wholesale oakleys, a public relations expert tells “The New York Times.” By packing your goodie bags full of stuff that runners will actually use after the race,cheap ray bans, your sponsors get the most exposure and your participants leave the race happy. Step 1 Tell vendors in your area that you looking for sponsors to help support the race and fill runner goodie bags. Give parameters for the bag inclusions,fake oakley cheap, such as samples,replica ray bans, coupons and fliers,michael kors for sale, along with the number of bags you like to fill. As Beal points out,cheap fake oakleys, the people who participate in races are the same active people who like to try new products,Andre Ellington Jersey Paypal Online, particularly if they runner centric. Step 3 Add some type of hydration to the bag as well. Whether it a small bottle of water or a sample electrolyte drink,wholesale cheap jerseys china, runners will be thirsty and can have something to drink while waiting at the finish line or for the awards portion of the race to start. Step 4 Ask sponsors to give items for runners skin,Authenitc Dwight Freeney Jersey, face and body. Lip balm,Cheap Matt Barkley Jersey, lotion and even a small tube of muscle cream can help runners in their post run recovery. Even if a sponsor doesn manufacture a skin or body item,cheap jerseys from china , they can use their own labels to still advertise their company while offering useful products and goodies to grateful runners. Step 5 Spend some of your race budget on memorabilia and race “swag.” Those who complete a 5K may want something to remember the experience by,cheap michael kors bags, so a hat,Authenitc Pat Tillman Jersey, T shirt or even a silicone bracelet is a cost effective and impactful way to fill out a post race goodie bag.